I am reposting this blog by Pam Smith aka The Turtle Path which was posted on August 3, 2018. Pam Smith was the Champion of the Western States 100-Mile Endurance Race in 2013 with a time of 18:37+ hours when Timothy Olson broke the Course Record. She finished 6th Overall and First-Runner-Up in The Female Category with a time of 28:47:53 hours in this year’s Badwater 135-Mile Ultramarathon. It is my intention to write a separate blog on this particular topic as part of my observation and experience as the Chief Crew of Ms Tess Leono. However, since I am not “in the know” of the actual expenses that my runner had incurred before, during, and after the event, my estimate of expenses will be purely not exact and accurate and that is why it will be always considered as an “estimate of expenses”. For an International Runner coming from Southeast Asia like the Philippines, a runner would add more of its expenses if he/she would pay for the flight fares of his/her support crew from the country where the runner is coming from. With an average of $1,200 per person, you can add another $4,800 to the total expenses. Merchandise and Souvenirs are not included in Pam Smith’s expenses and I would estimate another $300 for this purpose. International Runners like the Filipinos are fond of having some items for souvenir for the event like, Badwater T-shirts, Caps, Buffs or Stickers. Another thing that was not included is the Uniform T-Shirts/Long-Sleeved Shirts of the Team to include those OSHA gear aka Reflectorized Vests/Shirts and Blinkers. There is also a need to buy, at least, two (2) big Coleman Coolers, if possible, able to fit the core portion of the body of the runner if there is a need to submerge his/her body with ice water, to bring down the body temperature of the runner. So, there you go! If you have any plan to join in one of the future editions of the Badwater 135-Mile Ultramarathon, you better start saving now or have a plan where to source your logistics and financial support. Good luck! Every big ultra has its critics these days, and Badwater is no different. However, if you pay attention, almost all of the Badwater criticism comes from those outside the event; those who have participated are full of appreciation and praise. I am a cynic by nature and I admit there was plenty to make me skeptical as well. However, after participating in the race, I, too am a convert and you will only hear me say good things. That being said, the indisputable fact is that Badwater is a VERY expensive race and if this race is on your bucket list you might need to start saving a few years in advance! Here is a breakdown of my costs. I believe I spent significantly less than the average person, but there are a few places which I noted below where you could shave off a few more dollars. Badwater entry fee – $1500. This is probably the most criticized thing about Badwater – a $1500 entry fee and they don’t even have aid stations! This starts to make a little more sense when you are there when it finally dawns on you that Death Valley is really the middle of NOWHERE and there are no locals to help out, meaning many people have to be put up in hotels. There are a few niceties offered to runners, such as a cottage room in Panamint and a post race dinner for everyone. I will say the race had more officials for monitoring and safety on course than any race I have ever been at. Race officials found me three times to try to help me with my tracker (not entirely successful, but still appreciated) and I used the cottage room and footcare available at Panamint. Yes, the race is for profit and I am sure the RD gets a decent wage from the race, but this is now fairly commonplace in ultra running. The price is steep, but the only way around this is to pledge to raise $7500 for charity. Van: $750. I rented a van for a week for $525. I was a little taken aback when the person picking up the van added the $30/day insurance; however, this ended up being a good thing as we spilled dirty water in the van and it stunk to high heaven when we were done with it. The crew also reported there were a lot of places that it was easy to open doors into rocks. Anyway, we probably could’ve gotten by without the insurance, but it was nice to know we didn’t have to worry about anything we did to it while racing. Hotels: $1900. I had two hotel rooms for two nights in Furnace Creek and two rooms for two nights in Lone Pine, plus one extra night while traveling. Both places outside of Furnace Creek, we stayed at Best Western, which has air-conditioning (about half the hotels in Lone Pine don’t – your crew will thank you for the AC!) and a free breakfast (decreased food costs!). I got 10% off with my Costco card. I paid $127 in Fallon, NV and $141 x 4 in Lone Pine, both of which seemed reasonable. Furnace Creek is where you will pay an arm and a leg – nearly $300 per night per room – and anyone looking to save money should think about staying elsewhere and driving to the Sunday race briefing and the Monday night time start. I had my crew come in Sunday, which worked out fine in the end, but most people arrived Saturday which made for a bit more leisure time and less stressful race prep, but certainly adds to the costs, especially if that means more nights in Furnace Creek. Gas- $500. This was 6 tanks of gas to and from Oregon, plus three tanks of gas for the van to and from LA and during the race. Food – $500; Groceries -$150. A huge chunk of this was a $190 crew dinner on Sunday at the nicest place in Furnace Creek. On the bright side my crew didn’t do much drinking and they weren’t into dessert. 😉 I brought a lot of groceries from Oregon and several crew members traveled with food, which meant we had snacks and race food covered. Ice- $138. That’s 200 pounds of cube ice plus two frozen water jugs. Be prepared to be gouged on the ice pricing in Panamint (and severely limited) but every place else was reasonable and plentiful. Race Items and Supplies – $120. This is where I spent nearly nothing but you could easily rack up big bills here. Driving from Oregon meant I could bring things like coolers, sunscreen, towels, chairs, and spray bottles from home instead of buying when I got there. Critical gear includes: calf sleeves, arm sleeves, a high coverage hat, ice bandanas, and full protection sunglasses but I already owned all those things (and actually didn’t pay for any of them originally either!). I also wore clear glasses for most of the second night but I used a free pair of protective eye goggles I got from the hospital where I work. 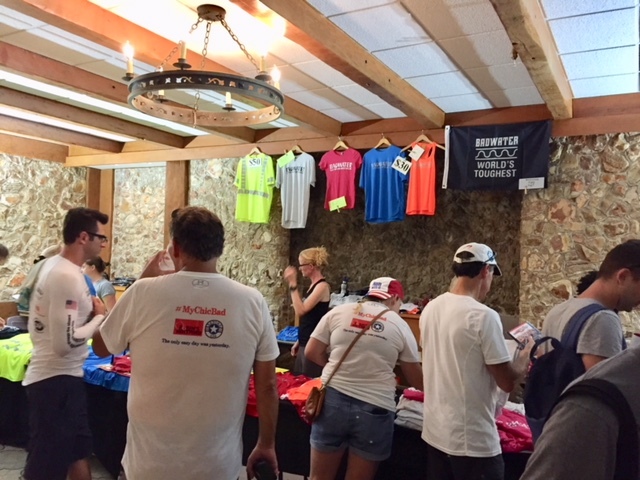 I did not buy any of the “add-ons” offered by the race, such as signs or crew shirts, nor did I have any matching team shirts for my crew (they have to be in OSHA gear anyway, so not like anyone really sees them on race day!). Next time (yes, I said that!) I will buy better OSHA gear because I borrowed and skimped and we should’ve had a little higher quality stuff. I did buy 8 red blinky lights ($28) and 10 “Biffy bags” ($25) (cheaper online than through the race) as required, plus one OSHA vest ($8), and an umbrella ($14). I was able to borrow coolers and water jugs from a local race as well as a crew member and only bought one extra large cooler at Walmart for $60. Total: ~$6,800. That’s a hefty price tag for a single race! (Now think about the ten time finishers or Marshall Ulrich and his 23 Badwater starts – yikes!). As one friend and excellent Badwater candidate told me, “I’d much rather vacation in Europe for that kind of money.” It’s hard to argue with that, and as such, a lot of top runners will never be on the starting line of this race. However, there’s a reason this is an iconic race and it was definitely a unique and special experience.